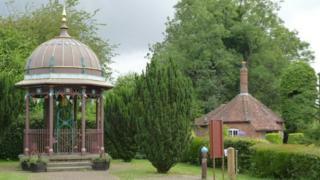 A Victorian well that was funded by an Indian maharajah has undergone £25,000 refurbishment works. Maharajah's Well was gifted to the residents of Stoke Row, Henley on Thames, Oxfordshire, by the Maharajah of Benares in the mid-1800s. He was moved by stories of water shortage in the area told to him by local landowner Edward Reade who worked in India for many years sinking wells. Revamp work has included refurbishing the well's gilded elephant statue. The restoration of the 368ft-deep (112m) well - which began in April - also involved repainting the well and its canopy using Victorian methods, the Maharajah's Well Trust charity, which has funded the work, said. Chair of the trust, Catherine Hale, described it as a "unique structure". "It's also an amazing story of this connection between a landowner in the Chilterns and a maharaja." Maharajah's Well was officially opened on 24 May 1864 and cost £353.